The Veterans Affairs Medical Centers strive to stay at the forefront of pain management and mental health treatments for our Service Members and Veterans. When a new treatment modality presents itself, the VA makes sure to test its efficiency in rigorous trials. So when transcranial magnetic stimulation (rTMS) came on the scene as a potential treatment for depression, the VA put it to the test. A group of 164 veterans with severe depression were recruited for the study, designed as a double-blind, randomized trial with some participants receiving rTMS therapy and others receiving a sham treatment. The trial took place over the course of four years (September 2012 through December 2016) in nine VA medical centers. The end result: magnetic stimulation was a flop, offering no greater success at treating depression than the sham treatment. Fortunately, there is another option for Service Members suffering from depression – and it’s already been proven effective time and time again by the U.S. Military and civilian researchers alike. Alpha-Stim® is an FDA cleared, handheld medical device that is proven to treat not only depression, but also anxiety, insomnia, and pain. Unlike rTMS, it has shown stellar success in clinical trials – over 100 of them, in fact. More than 200 Department of Defense (DOD) practitioners and over 92 VA hospitals use Alpha-Stim to treat military personnel for all of these indications. The U.S. Navy has incorporated Alpha-Stim as a key part of its pain management program; Walter Reed Medical Center conducted an EEG study proving Alpha-Stim’s efficacy among active duty Service Members; and the William Beaumont Army Medical Center, a leader in pain management for the military, relies on Alpha-Stim as part of its treatment protocol. The trust of the Department of Defense speaks volumes – but so do the testimonials of veterans who have found relief with Alpha-Stim. One Navy SEAL tried everything, but found no relief from his mental distress until he found Alpha-Stim. 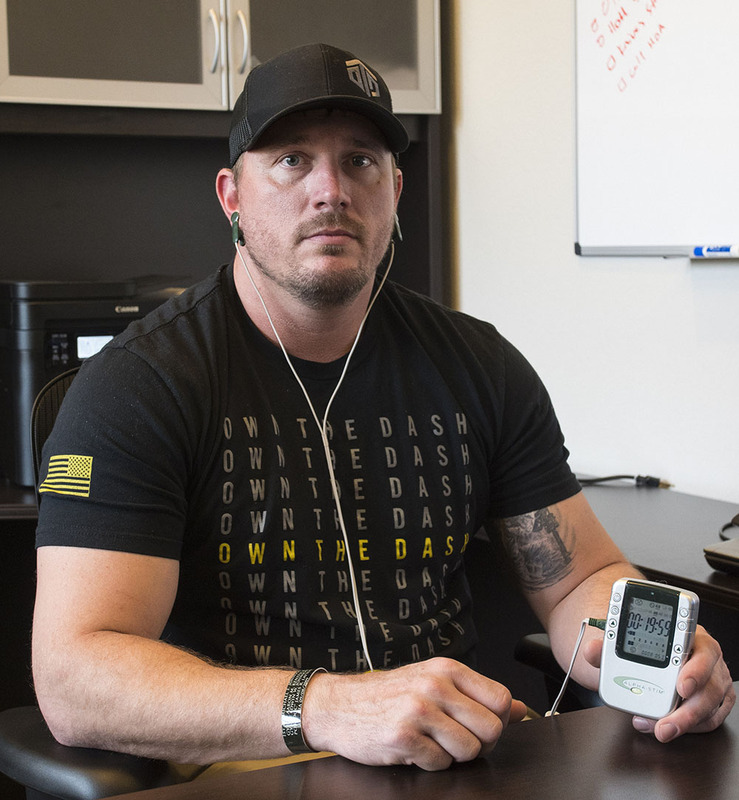 Dakota Meyer, Marine and Medal of Honor Recipient, has been outspoken in his praise of the device for his mental health. One veteran even avoided the amputation of both legs once he began treatment with Alpha-Stim and finally experienced pain relief. 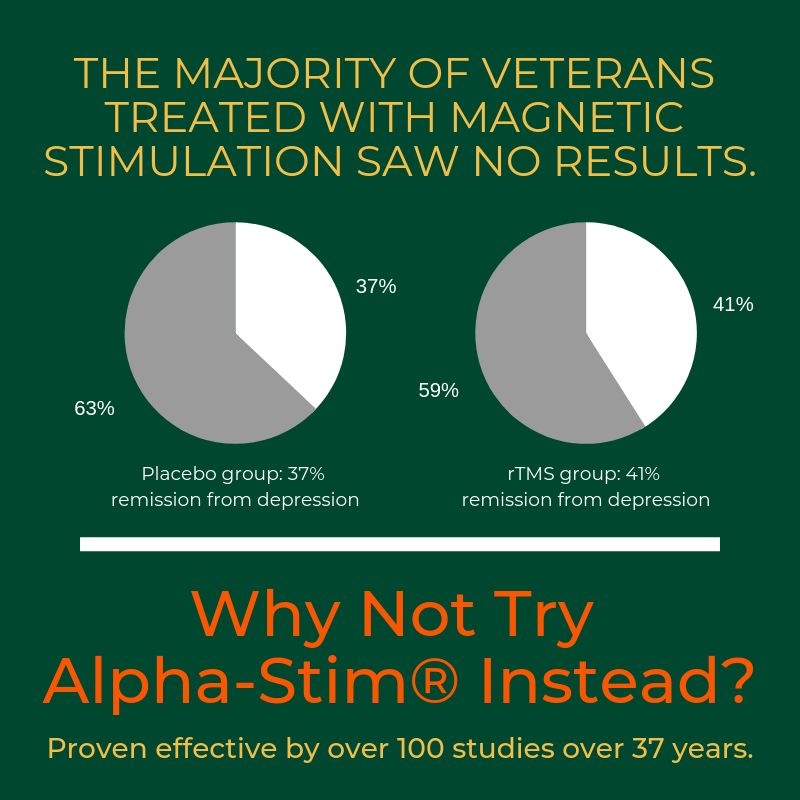 Transcranial magnetic stimulation might have been a disappointment when put to the test – but Alpha-Stim won’t let you down. In fact, we’re so confident you’ll be pleased with your results, we’ll give you 30 days to try it. Not only is it more effective than rTMS, but it’s less expensive, too – and treatments can be performed in the comfort of your own home. Depression in Service Members can be especially challenging to treat, but Alpha-Stim is up to the task. Veterans and current Service Members, call 1-800-FOR-PAIN and ask to speak to Government Services. Get started today to see the results that have earned us the trust of the U.S. Military, and so many of our men and women in uniform.